Annette Britton with her rooftop wind turbine. Annette had imagined a windmill at her childhood home since she was 10 years old. “I would go outside to play, lie in the grass, and feel the strong wind channel there,” she remembered. 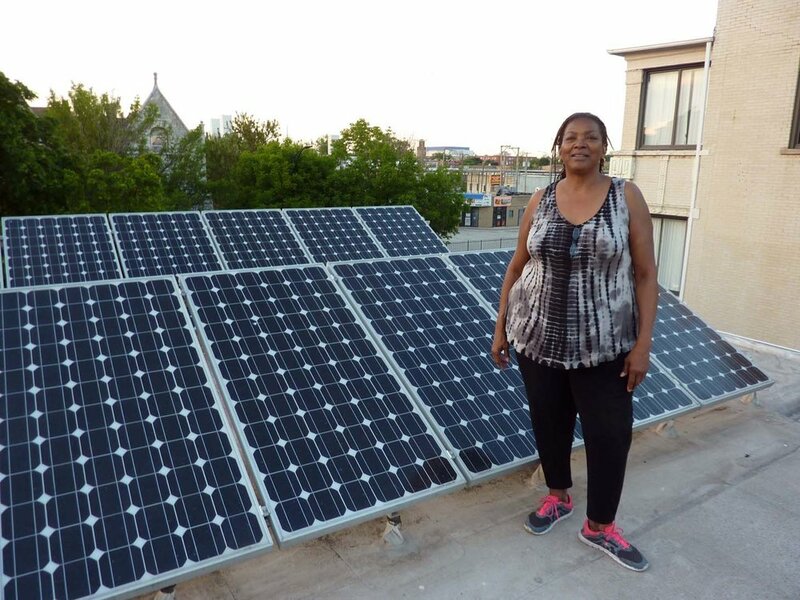 Annette stands next to her rooftop solar panels. After working as an electrical engineer for Xerox in New York and then moving to Arizona to write a book, Annette returned to the Garfield Park home of her childhood to help her sick mother. Tears filled her eyes as she described the changes that had taken place in the intervening years. Annette explained that divestment started after Martin Luther King, Jr. was killed in 1968. Then the West Side of Chicago erupted with rioting. Finally, 50 years later, re-investment in Garfield Park is beginning slowly with the current construction of the Hatchery, a “food incubator” of 56 kitchens for food truck food preparation. City leaders estimate 900 jobs will result. Annette is skeptical but hopes for the best. At the Green Fest, Earth Wind and Solar tried to convince her that solar panels would be superior to a wind turbine on her home because of residential regulations, but Annette was determined. Finally, the company visited her house to conduct a wind test and make sure the turbine could be mounted on her roof in accordance with the city's strict regulations. They also managed to convince her to install solar panels so that in the end, she had the first residential hybrid solar and wind energy system in the City of Chicago. In technical terms, Annette has a 1kW UGE grid-tied vertical axis wind turbine (VAWT) and a 2,180kW solar PV array. She estimates the system offsets her power usage by 30 percent to 40 percent, helping her control energy costs. She believes that people on a fixed income or a lower working class income need renewables most urgently in order to reduce energy costs. On bright, sunny days, Annette’s 12 solar panels + 1 wind turbine can even make her meter run backward. “And so here I am, doing my part. Wherever I live, I have a responsibility to make it better, if for no other reason than that I live where I do,” she said. And, yes, Annette did meet John Perkins at the Green Fest and asked him to sign her copy of his book. Annette Britton’s home in Garfield Park.